The relative humidity is 71%. The wind is blowing at a speed of 3.1mph from North-northeast(20°) . The helipads are located on a concrete apron north of the circuit complex and are marked H1, H2 and H3 (see plan). H1 is normally used by site owner Jonathan Palmer so please use helipads H2 and H3 first and H1 only if the others are occupied. If H1, H2 and H3 are occupied, please land on the grass in the area H4. Jet A1 fuel is available. 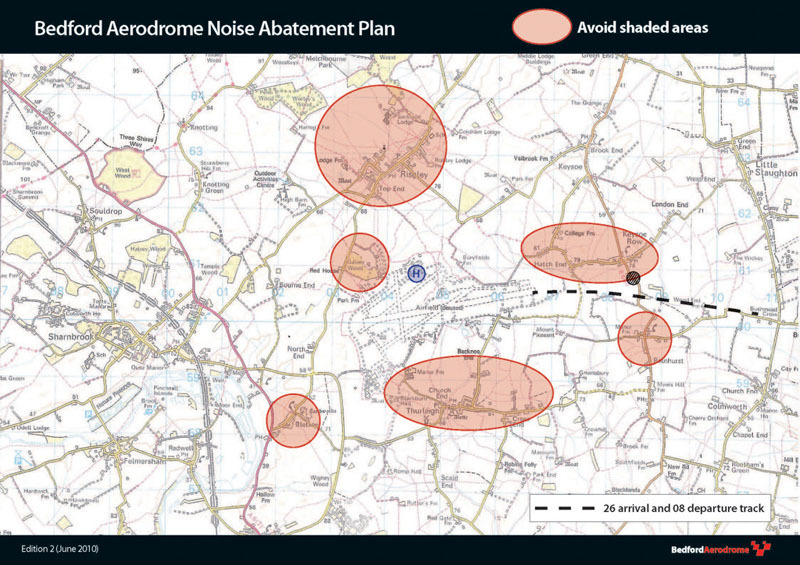 On approach towards the Autodrome please maintain 1000ft until the Autodrome boundary, avoiding villages as shown on the Noise Abatement Plan. Final approach to the helipads should be from the south, maintaining at least 100ft over the track immediately to the south, which is likely to be active with race cars. The Bedford Autodrome helipads are 1 mile north-west of the airfield Bedford Aerodrome (EGBF), also operated by MSV. Although EGBF is a licensed aerodrome, movements are few and the frequency 119.025* may not be manned, but please make blind calls. Watch out for the possibility of fixed wing traffic. Landing is by prior permission only. Please call PalmerSport on 01403 733999 or email eventcoords@palmersport.com. It will be necessary to complete the Landing Request Form and email or fax as instructed. If you change plans and do not fly, or your arrival time is expected to be significantly different to that estimated, please call Bedford Autodrome on 01234 332400. If you would prefer to land at the aerodrome you are welcome to do so, landing on Apron C. We can arrange ground transport to the hospitality areas and offices. Please refer to the aerodrome details and booking information on this site. Site and content © 2019, MotorSport Vision Ltd.